Hughes-Stovin syndrome (HSS) is a very rare clinical entity characterized by pulmonary artery aneurysms and deep vein thrombosis (DVT).1 The exact etiology of this syndrome is not clear and it is often considered a variant of Behçet’s disease. 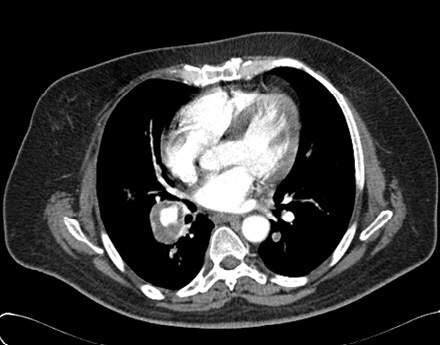 Although the symptoms can be non-specific, HSS can sometimes present with life-threatening hemoptysis.2 We report a patient with bilateral pulmonary artery aneurysms and lower-limb DVT who developed massive hemoptysis shortly after admission. 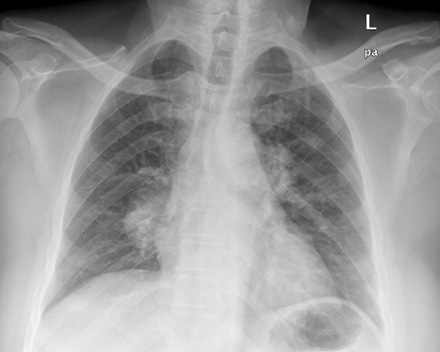 Figure 1: Chest radiograph showing the bilateral hilar enlargement. Figure 2: Computed tomography chest scan showing the right pulmonary artery aneurysm measuring about 3cm in diameter. Evidence of the characteristic intraluminal thrombi lining the wall is visible. A 53-year-old Omani male was referred from a private clinic for a malignancy work-up. He presented with a four-month history of coughing, fever, shortness of breath, repeated episodes of mild hemoptysis, and significant weight loss. A chest radiograph showed bilateral hilar shadows [Figure 1]. 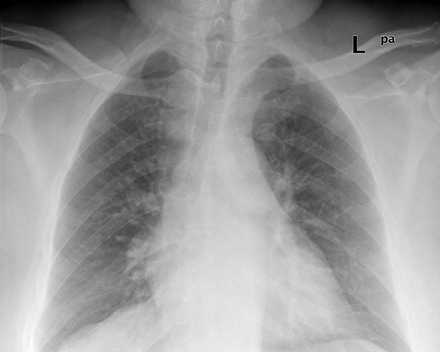 Figure 3: Chest radiograph taken three months after presentation showing marked resolution of the hilar shadows. The patient was treated with pulsed methyl prednisolone (500mg daily for three days) and intravenous cyclophosphamide (750mg). He continued to have mild hemoptysis for one day before it settled. His blood pressure remained within the low range and he required high flow oxygen for a couple of days, initially at 10L/minute through a non-rebreather mask. A bedside echocardiogram did not show any evidence of intracardiac thrombi or pulmonary hypertension. The patient developed massive hemoptysis, features of thrombus in the pulmonary artery, and DVT. This raised the question of prescribing anticoagulation medication, however, anticoagulants were not given due to the known risk of a fatal hemorrhage occurring as a result of the pulmonary artery aneurysms. The patient was then prescribed oral prednisolone at 50mg daily for one week, followed by 40mg daily for two weeks. He was slowly tapered to a maintenance dose. Monthly cyclophosphamide injections continued for a year. A chest radiograph after three months showed almost complete resolution of the hilar shadows [Figure 3]. At two-year follow-up, the patient was on a daily dose of prednisolone 5mg and mycophenolate 5mg, he had not redeveloped hemoptysis, and had remained relatively asymptomatic. HSS is a very rare clinical condition which was first described by two British physicians, Hughes and Stovin, in 1959.3 It usually affects young men aged between 12–40 years. The characteristics of HSS are the formation of DVT and pulmonary artery aneurysms. The initial presentation is usually non-specific and patients may present with coughing, shortness of breath, fever, or chest pain. Hemoptysis can either arise later or be observed at the initial presentation.4 The aneurysms usually involve the pulmonary and/or the bronchial arteries, although the systemic circulation can be affected too.5 They can present with vascular thromboembolism, arterial aneurysms, arterial and venous occlusions, non-specific vasculitis, and even thrombophlebitis. The most serious complication of HSS is the possibility of developing a massive and potentially fatal hemorrhage. The exact etiology of HSS remains unclear. While infection and sepsis were considered possible causes of this syndrome, the absence of any positive cultures, and the lack of patient response to antibiotics does not support this hypothesis.6,7 The current consensus is that HSS results from vasculitis, similar to the vasculitis seen in Behçet’s disease.8,9 In fact, some consider HSS an "incomplete" form of Behçet’s disease since the same combination of multiple pulmonary aneurysms and peripheral vein thrombosis have been described in Behçet’s disease.9,10 However, the typical features of Behçet’s disease, such as orogential ulcers, skin lesions, iritis, or arthritis are missing in most HSS cases. No standardized guidelines exist for the treatment of HSS and immunosuppressant drugs remain the predominant first-line therapy.11,14 This usually involves a combination of steroids and cytotoxic agents, the most commonly used being cyclophosphamide. Anticoagulants and thrombolytic agents are generally contraindicated in patients with HSS due to the increased risk of fatal hemorrhage from pulmonary aneurysms.7,15 Therefore, the physician is often confronted with a challenge regarding optimal patient management particularly when an embolic state is noted in patients with a pro-thrombotic tendency.8 Some of these patients may even have hemoptysis upon initial presentation. Hemoptysis can occur due to the rupture of an aneurysm, acute vasculitis, or due to rupture of the angiodysplastic bronchial arteries. Anticoagulation medications have been used judiciously in patients with intracardiac thrombi or embolisms in the main pulmonary artery and in those with hemodynamic instability.16 Some physicians have used anticoagulants in cases of unilateral single pulmonary aneurysms that were surgically resected, or after adequate immunosuppressive treatment.2,15 However, the need for anticoagulation is not always clear as the risk of pulmonary embolism is very low and these patients may still develop thrombosis despite adequate anticoagulation.7,17 Anticoagulation medications should be considered with extreme caution and only in clinical situations where the benefits clearly outweigh the risks. More studies are required to reach a consensus on this issue. Surgical resection of the affected lung can be considered if the aneurysms are at a high risk of rupturing and/or are localized to one segment or one lung.2,5 However, surgical interventions usually carry a higher risk and the pulmonary aneurysms often tend to be both bilateral and multiple. Embolization can also be considered in patients in danger of rupturing or in cases of fatal hemoptysis.5,15 In our patient, the massive hemoptysis was managed successfully with a combination of steroids and cyclophosphamide. This case highlights the effectiveness of immunosuppressant treatment in the management of massive hemoptysis in a patient with HSS. HSS is a very rare, clinical disorder that is characterized by pulmonary artery aneurysms and DVT. It is similar to Behçet’s disease but lacks many of the other features of this disease, such as orogential ulcers. This case report presents a patient with HSS who developed a massive hemoptysis and who was managed successfully with a combination of steroids and cyclophosphamide treatment. Kopp WL, Green RA. Pulmonary artery aneurysms with recurrent thrombophlebitis. The "Hughes-Stovin syndrome". Ann Intern Med 1962 Jan;56:105-114. Al-Jahdali H. Massive hemoptysis and deep venous thrombosis presenting in a woman with Hughes-Stovin syndrome: a case report. J Med Case Rep 2010;4:109. Hughes JP, Stovin PG. Segmental pulmonary artery aneurysms with peripheral venous thrombosis. Br J Dis Chest 1959 Jan;53(1):19-27. Choh NA, Jehangir M, Mir KM, Kuchay S, Wani NA. Hughes-Stovin syndrome: A rare cause of hemoptysis. Lung India 2011 Oct;28(4):285-286. Herb S, Hetzel M, Hetzel J, Friedrich J, Weber J. An unusual case of Hughes-Stovin syndrome. Eur Respir J 1998 May;11(5):1191-1193. Charlton RW, Du Plessis LA. Multiple pulmonary artery aneurysms. Thorax 1961 Dec;16:364-371. Khalid U, Saleem T. Hughes-Stovin syndrome. Orphanet J Rare Dis 2011;6:15. Durieux P, Bletry O, Huchon G, Wechsler B, Chretien J, Godeau P. Multiple pulmonary arterial aneurysms in Behcet’s disease and Hughes-Stovin syndrome. Am J Med 1981 Oct;71(4):736-741. Grenier P, Bletry O, Cornud F, Godeau P, Nahum H. Pulmonary involvement in Behcet disease. AJR Am J Roentgenol 1981 Sep;137(3):565-569. Emad Y, Ragab Y, Shawki Ael-H, Gheita T, El-Marakbi A, Salama MH. Hughes-Stovin syndrome: is it incomplete Behçetís? Report of two cases and review of the literature. Clin Rheumatol 2007 Nov;26(11):1993-1996. Bowman S, Honey M. Pulmonary arterial occlusions and aneurysms: a forme fruste of Behçetís or Hughes-Stovin syndrome. Br Heart J 1990 Jan;63(1):66-68. Mahlo HR, Elsner K, Rieber A, Brambs HJ. New approach in the diagnosis of and therapy for Hughes-Stovin syndrome. AJR Am J Roentgenol 1996 Sep;167(3):817-818. Ketchum ES, Zamanian RT, Fleischmann D. CT angiography of pulmonary artery aneurysms in Hughes-Stovin syndrome. AJR Am J Roentgenol 2005 Aug;185(2):330-332. Lee J, Noh JW, Hwang JW, Kim H, Ahn JK, Koh EM, et al. Successful cyclophosphamide therapy with complete resolution of pulmonary artery aneurysm in Hughes-Stovin syndrome patient. Clin Rheumatol 2008 Nov;27(11):1455-1458. Erkan F, Gül A, Tasali E. Pulmonary manifestations of Behçetís disease. Thorax 2001 Jul;56(7):572-578. Tsai CL, Lu TC, Tsai KC, Chen WJ. Hemoptysis caused by Hughes-Stovin syndrome. Am J Emerg Med 2005 Mar;23(2):209-211. Erkan D, Yazici Y, Sanders A, Trost D, Yazici H. Is Hughes-Stovin syndrome Behçetís disease? Clin Exp Rheumatol 2004 Jul-Aug;22(4 Suppl 34):S64-S68.